Traffic Tickets: Not Just for Speeders! How much do you know about Missouri Traffic Law? Unless you are a Missouri Traffic Law Attorney, probably not very much. There are over 100 laws that are subject to tickets that have nothing to do with speeding. From making an illegal left turn to driving through a red light without stopping, these tickets can cause you as much time, money and hassle as a speeding ticket. 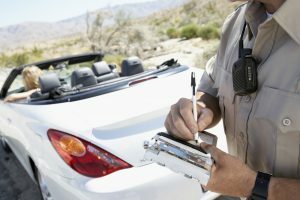 Depending on the traffic law that was broken, these tickets can affect your insurance costs and driving record just like speeding tickets. We have all seen the ‘double fine’ signs along roadways under construction or renovation. We have all experienced the inconvenience and aggravation of being held up several minutes to even several hours for roadwork. We have all, at one time or more, been stuck behind the semi-truck that is going 20 miles an hour even slower than the posted speed on a single lane, no passing allowed, stretch of roadwork. However, we realize that the work is necessary so we deal with it. If you accidentally hit a traffic cone or a barrier, an officer may ticket you for intentionally hitting it or for reckless driving. If an officer thinks you are in any way endangering a worker, you will get ticketed. If you can’t tell exactly where you are supposed to drive through a construction zone, and make a wrong guess, you can be ticketed. It is obvious that none of us knows all the rules and regulations when it comes to the many traffic violations that are laws. Good traffic attorneys are invaluable when we need to save our driving record, our insurance costs, and our reputations. In Missouri, contact Springfield Traffic Tickets by phone (417) 414-0849 or visit their website for the finest traffic ticket attorneys in Missouri.